Glutathione S-transferases (GSTs) have been reported to regulate the plant tolerance to environmental stresses. Many plant GSTs exhibited the roles on promoting tolerance to drought stress, oxidative stress and plant hormones. The biological function of GSTs has been well characterized in Arabidopsis thaliana in response to exogenous environmental stresses. However, their regulation function under exogenous environmental stresses regulating leaf abscission in cassava (Manihot esculenta Crantz) remained unknown. Here, 83 GSTs were identified from tropical plant cassava. The amino acid motifs and phylogenetic analyses indicated that MeGSTs were divided into 9 classes. The global expression analyses were carried out to analyze the gene expression patterns of MeGST in cassava abscission zones by comparing the MeGST genes expression patterns in both ethylene and drought induced cassava leaf abscission. Totally, 34 GSTs were detected to express in both ethylene and drought induced leaf abscission in cassava abscission zones. Comparison of GST expression profiling between ethylene and drought induced leaf abscission suggested that Tau GST genes showed with the similar expression in both treatments induced leaf abscission in cassava abscission zone. GO annotation indicated that all 17 Tau GST genes participated in the pathway of toxin catabolism (GO: 0009407). The expression levels of 17 Tau MeGST genes were analyzed in two cassava cultivars, ‘SC124’ and ‘Arg7’, the two cultivars exhibit different levels of leaf abscission when suffered from the same environmental stress. Higher expression levels of Tau MeGSTs were detected in the precocious abscission Arg7 cultivar, while lower expression levels in delayed abscission SC124 cultivar. All the results indicated that Tau MeGSTs have the function in regulation the cassava leaf abscission under environmental stresses. Analysis of the expression patterns of GSTs in various abscission-promoting treatments in cassava abscission zones helps us to understand the possible roles of GSTs in cassava leaf abscission. Glutathione S-transferases (GSTs; EC 2.5.1.18), as detoxification enzymes, are widely presented in plants, bacteria, fungi and animals . GSTs have the ability to detoxicate the cytotoxic compounds produced by environmental stresses . Generally, a conserved GSH binding site (G-site) located in the N-terminal domain of GSTs, and an electrophilic substrate binding site (H-site) in C-terminal domain of GSTs . In Arabidopsis, GSTs can be divided into eight subfamilies based on amino acid sequence similarity, including Phi, Tau, Theta, Zeta, Lambda, DHAR, TCHQD and MAPEG [1, 2]. Since then several new classes were added to the GST protein family, such as EF1Bγ and GHR class GSTs [3, 4]. Phi and Tau are the two largest plant-specific GSTs; these GSTs can regulate stress responses [1, 2]. Up to now, numerous GST gene family members have been identified in various species by genome-wide analysis, i.e., 81 GST genes in Populus , 55 GST genes in Arabidopsis , 79 in rice [7, 8], 84 in barley , 23 in sweet orange , 27 in Japanese larch [1, 10], and 59 and 49 in the G. raimondii and G. arboreum genome . Many plant GSTs exhibited peroxidase activity and played function in promoting tolerance to oxidative stress, osmotic dehydration and plant hormones [1, 2]. In Arabidopsis, Phi GST 9 (GSTF9) was induced by salt and salicylic acid responses that acted the function in regulating redox homeostasis . GST11 was discovered to regulate the plants tolerance to oxidative stress, metal toxicities and extreme of temperature . Four Phi GSTs displayed to participate in plant stress regulation by co-silencing of multiple genes to alter metabolic sensitivity of the plants to oxidative stress . Tau GST8 was up-expressed by oxidative stress, exhibiting the gene has the function to regulate oxidative reaction in stressed plants . Two classes of GSTs (DHARs and GSTLs) were induced by chemicals and oxidative stresses, exhibiting the function to regulate redox homeostasis in stressed plants . GSTU19 was induced by salt and drought; exhibiting an increased activity of antioxidant enzymes and the level of proline in transgenic plants . GSTU17 can be induced by phytohormones . The GSTF2 protein can be up-regulated by ethylene treatment . The GSTs can be induced by allyl isothiocyanate at lower doses; the up-regulation of GSTs was proved to promote the tolerance to oxidative stress . In rice, over expression of GSTU4 has been proved to improve resistance to oxidative stress and salinity stress . In soybean, GSTL1 was induced by salt treatment; over expression this gene markedly decreased the accumulation of reactive oxygen species in transgenic plants under salt stress . In Pyrus pyrifolia, one GST was induced by abiotic stress, transgenic lines showed the ability to enhance tolerance to oxidative damage . In Salicornia brachiata, GSTU can be induced by various abiotic stressors . Cassava (Manihot esculenta Crantz) plants have the ability to adapt to new stress conditions by shedding leaves at their petioles when the plants suffer from the adverse environmental stresses , which confers the plants have the ability to resist to adverse environmental stresses . In our previous study, we proved ROS and ethylene to act the function in regulating the separation of leaf petioles under drought by transcriptomic, physiological and transgenic methods. Moreover, ROS can be increased by the accumulation of proline and polyamine in cassava abscission zones under drought stress . Proline is one of the precursors of polyamine biosynthesis. In our previous research, proline degradation into polyamine was occurred at the abscission zones under drought. Polyamine produced from proline can be depredated into ROS (hydrogen peroxide) by polyamine oxidase gene (PAO) in cassava abscission zones . Under various environmental stresses, GSTs from plants exhibited peroxidase activity and played roles on enhancing tolerance to oxidative stress [1, 2]. Many GST genes were identified from various plants ; however, no information is available regarding the GST family in cassava. In this study, we identified 83 GST family members from the cassava genome, the number of GST genes in cassava genome is a little more than the number in the Populus genome (81 GSTs) . An evolutionary analysis suggested that 83 cassava GSTs could be grouped into 9 subfamilies. Further, the phylogenetic tree and amino acid motifs prediction and analysis were carried out. A globe microarray analysis was used to analyze the GSTs that presented in cassava abscission zones in both drought and ethylene treatments induced leaf abscission; the comparison analyses of the expression pattern of MeGSTs between ethylene and drought treatments induced leaf abscission showed the MeGSTs had similar expression profiles in both treatments. Further research indicated 17 Tau GSTs are widely up-regulated in the cassava abscission zones by comparison of GST expression profiles between ethylene and drought induced leaf abscission. These Tau GSTs were further identified in two cassava cultivars with different degrees of leaf abscission when suffered from the same drought stress. Together, the data indicate that Tau GSTs regulate the progression of cassava leaf abscission. Cassava cultivars SC124 and Arg7 were planted in plastic pots in greenhouse for six months, the cassava plants grown in greenhouse at 28 °C with a 16 h light photoperiod (130 μmol·m− 2·s− 1). In one pot, three plants were planted, and three pots were used as a biological replicate . To identify the cassava GST genes in abscission zones, 90 days old of cassava abscission zones were collected from cassava genotypes under standard and stress conditions . Chlorophyll fluorescence parameter Fv/Fm  was used to evaluate the process of leaf abscission in both drought and ethylene treatments . For ethylene treatment, cassava plants were sprayed with 100 μM ethylene; for drought treatment, the cassava plants grown with no water under green house room. For collection the samples of ethylene and drought treatments, Fv/Fm values were used to collect abscission zone samples at six time points during stresses. To confirm the expression profiles under drought in microarray with real time PCR, samples were cut from cassava plants with three biological replicate pots and repeated 3 times for each time point. GST protein sequences of cassava and Populus were obtained from the genomes in the Phytozome (https://phytozome.jgi.doe.gov/pz/portal.html#!info?alias=Org_Mesculenta) and NCBI databases, respectively . 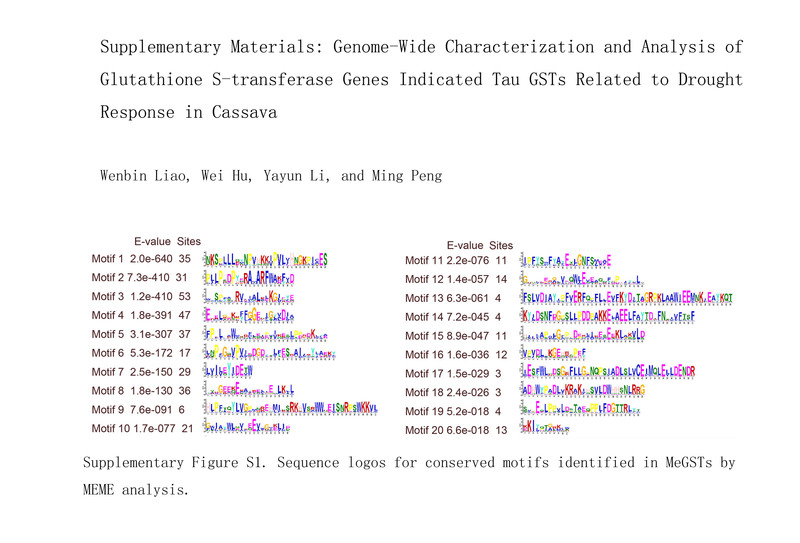 To identify the cassava GST family genes, known GST from Populus as a query to search the cassava genome database with local Hidden Markov Model-based searche (https://www.techylib.com/fr/view/powemryologist/stif_hidden_markov_model-based_search_algorithm_for_the); subsequently, the predicted GSTs from cassava database were evaluated by BLAST searche with homologous GSTs from other plant species. Then, the candidate GST proteins were further analyzed by PFAM (http://pfam.sanger.ac.uk/) database analysis and CDD (http://www.ncbi.nlm.nih.gov/cdd/) analysis. After that, the conserved domains analyses were carried out to confirm the predicted MeGST proteins with multiple sequence alignments. Finally, all GST proteins from cassava and Populus alignment analyses were confirmed by Clustal X 2.0 analysis. The bootstrap neighbour-joining analysis was carried out by MEGA 5.0 software. The gene motif detection of all 83 cassava MeGSTs was analyzed by the Multiple Em program from the Motif Elicitation (MEME; version 4.9.0) tool, the parameters of the conserved motifs in all cassava GST proteins were identified as previously described [22, 23]. InterProScan (http://www.ebi.ac.uk/Tools/pfa/iprscan/) were performed to annotate the motifs. The microarray analyses for either ethylene or drought treatment were carried out as previously described . The abscission zones samples of drought and ethylene treatments were collected for total RNA extraction with a plant RNeasy extraction kit (TIANGEN, Beijing, China) for transcriptome analysis . The samples were repeated for 3 times, and the replicate samples were separately sequenced. The transcriptome analyses were performed as previously described . For microarray data analysis, the up or down regulated GST genes exceeding a threshold fold change > 2.0 or < 0.5 (log base 2), a Wilcoxon Rank-Sum test significance level at 0.05 (P < 0.05) were considered significant.For Quantitative real-time PCR analysis, the relative expression was used to elevate the transcript levels of the candidate genes. The up or down regulated GSTs were grouped by Hierarchical clustering with the MeV 4.0 software. GO annotation of Tau MeGSTs genes was carried out by BiNGO according to Maere et al., (2005) . RNA from three independent biological cassava abscission zone samples under drought or ethylene treatments were used for real-time qRT-PCR on a STEP-ONE system with SYBR Green I (Carlsbad, CA) detection. The real-time qRT-PCR performed as previously described . The primer sequences for real-time PCR are listed in Additional file 1 Data 1. A total of 83 cassava GSTs (Additional file 2: Data 2) were identified from the cassava genome (annotation v. 6.1) with a BLAST search of the cassava genome database with homologous GST coding sequences from plant species as queries. The gene set represents approximately 0.2513% (83/33,033) of the annotated genes in cassava genome (33,033 genes), which is a little bigger than the proportion of Arabidopsis genome (0.2006%) [25–28]. To study the phylogenetic relationships of the GST genes between cassava and Populus, all identified cassava GSTs and those from Populus were analyzed with the multiple sequence alignment analysis. 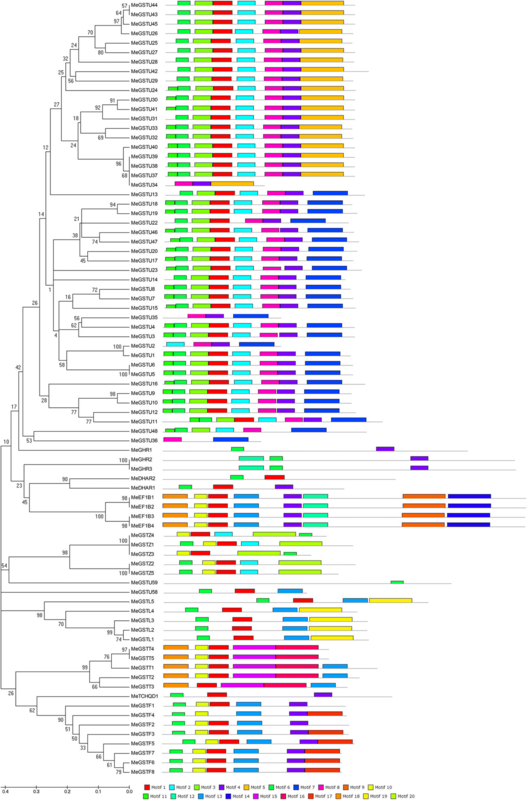 A phylogenetic tree including GSTs form cassava (83) and Populus (81) was generated (Fig. 1). The resulting phylogenetic tree contained 9 classes, termed Phi, Tau, Theta, Zeta, Lambda, DHAR, TCHQD, EF1Bγ and GHR classes. All of the classes contained GST from cassava and Populus genomes, some of these members from both Populus and cassava can be clustered together, suggesting that these members may act the same function in plant development. The Tau GST class showed have the maximum number of members, including 59 members came from cassava and 58 from Populus, respectively. The minimum number of members was TCHQD class, only 1 member from cassava and 1 member from Populus genome. To confirm the conserved protein motifs in all the GST proteins, the Multiple Em program for the Motif Elicitation (MEME; version 4.9.0) tool analysis was carried out to evaluate all the 83 MeGST proteins. 20 conserved protein motifs in the MeGSTs were detected by MEME software analysis and the motif annotation was analyzed with InterPro analysis. The motif lengths with 11 and 50 amino acids long were confirmed by MEME analysis (Fig. 2; Additional file 3: Figure S1). In detail, most of the Phi GST genes have motifs 4, 6, 10 and 13; most of the Tau GST genes have motifs 1, 2, 3, 4, and 8; most of the Theta GST genes have motifs 1, 15, 16 and 18; most of the Zeta GST genes have motifs 1, 10 and 20; most of the Lambda GST genes have motifs 1, 6 and 13; the DHAR GST genes have motifs 1, and 6; the TCHQD GST genes have motifs 1, 4, and 6; the GHR GST genes have motifs 4 and 6; the EF1Bγ GST genes have motifs 1, 4, 9, 10, 12, 13, 14, and 18. To identify the MeGST gene expression patterns in both ethylene and drought induced cassava leaf abscission, six time points were determined in both treatments by cassava leaf Fv/Fm values detection described as our previous research . To confirm the gene expression patterns in cassava abscission zones in both ethylene and drought induced leaf abscission, a whole genome microarray (NimbleGen) of cassava was constructed and analyzed as our previous research . In the data of microarray, 40 GSTs were detected with different expression patterns in ethylene induced leaf abscission, while 37 GST genes were differentially expressed in drought induced leaf abscission (Additional file 4: Data 3). 34 GST genes were detected with co-expression in both ethylene and drought induced leaf abscission (Fig. 3). 6 GST genes were expressed only in ethylene induced leaf abscission, i.e. MeGSTL1, MeGSTU10, MeGSTU16, MeGSTU24; MeMAPEG1, MeMAPEG2; 4 GST genes were expressed only in drought induced leaf abscission, i.e. MeGSTF7, MeGSTF8, MeGSTL1 (Fig. 3, Additional file 4: Data 3). In all 40 MeGST genes differentially expressed in ethylene induced leaf abscission, all 40 MeGST genes were analyzed by SOTA analysis, and five clusters (EthS1-EthS5) were grouped by SOTA analysis, moreover, five clusters were classified into four groups of expression patterns (Fig. 4 and Additional file 5: Data 4). The first group (clusters EthS5) represents the GST genes that were up-regulated in the whole experimental period compared with the T1 time point control in ethylene induced leaf abscission, 27 genes grouped into this expression patterns. The second group included the genes shown in cluster EthS3, exhibiting the genes up-regulated in T2 time point, 4 genes showed the expression pattern in this group. The third group (clusters EthS1 and EthS2) showed the genes up-regulated in T3 and T4 time points, 4 genes grouped into this expression pattern. The fourth group (cluster EthS4) exhibited the genes that down-regulated throughout the experimental period, 5 genes were grouped into this expression pattern. In 37 GST genes expressed in drought induced leaf abscission, five clusters (DrS1-DrS5) were grouped by SOTA analysis, and five clusters could be classified into three classes of expression profilings (Fig. 4 and Additional file 5: Data 4). The first class (clusters DrS1) exhibited the genes that up-regulated in the whole experimental period while compared with the T1 time point, 24 genes were grouped into this expression pattern. The second group (cluster DrS2) showed the genes that up-regulated in the T2 time point, 4 genes were classed into this expression pattern. The third group (cluster DrS3, DrS4 and DrS5) exhibited the genes that down-regulated in the whole experimental period, 9 genes were classed into this expression pattern. The comparison of MeGST expression profiles in both ethylene and drought induced leaf abscission were carried out by SOTA clustering to confirm the GST genes that participate in both treatments. So the similar expression profiles of GSTs at each time point in both ethylene and drought treatments were analyzed. We first examined the GST genes that were up-regulated in the whole experimental period compared with the T1 time point in response to both treatments (Fig. 4 and Additional file 1: Data 1). The expression profiles of genes in EthS5 in ethylene treatment and DrS1 in drought treatment were first compared. 27 genes in ethylene treatment were grouped into this group, GO annotation indicated that 10 genes participated in the pathway of toxin catabolism (GO: 0009407), 4 genes participated in the pathway of response to cadmium ion (GO: 0046686), 2 genes participated in the pathway of response to oxidative stress (GO: 0006979). 24 genes in drought treatment were classed into this group, GO annotation indicated that 10 genes also participated in the pathway of toxin catabolism (GO: 0009407), 4 genes participated in the pathway of response to cadmium ion (GO: 0046686), 2 genes participated in the pathway of response to oxidative stress (GO: 0006979). 19 GST genes were detected with similar expression patterns in both treatments, i.e. MeGSTF3, MeGSTF6, MeGSTL2, MeGSTU11, MeGSTU13, MeGSTU14, MeGSTU18, MeGSTU19, MeGSTU20, MeGSTU27, MeGSTU3, MeGSTU30, MeGSTU34, MeGSTU35, MeGSTU5, MeGSTU6, MeGSTU7, MeGSTU9 and MeGSTZ2. GO annotation indicated that 9 genes participated in the pathway of toxin catabolism (GO: 0009407), 4 genes participated in the pathway of response to cadmium ion (GO: 0046686), 2 genes participated in the pathway of response to oxidative stress (GO: 0006979). The 19 GST genes have similar expression pattern in both treatment, however, the levels of up-regulation were different in both treatments, more genes with higher expression levels (> 5 times expression levels compared with control) in ethylene treatment were detected while compared with the genes in drought treatment. In ethylene treatment, MeGSTU18, MeGSTU20, MeGSTU11, MeGSTU19, MeGSTU3, MeGSTU30, MeGSTU34 and MeGSTU9 were detected with high expression levels under ethylene induced leaf abscission; while in drought treatment, only MeGSTU18, MeGSTU11 and MeGSTU34 were examined with high expression levels under drought induced leaf abscission. Quantitative real-time PCR also confirmed these MeGSTs expressed with high levels under ethylene and drought treatments based on microarray data (Fig. 5). At the early stage of leaf abscission (T2), the EthS3 cluster in ethylene treatment and DeS2 cluster in drought treatment showed similar expression profiles in both treatments at T2 time point (Fig. 4). 4 genes, MeGSTZ1, MeGSTU28, MeGSTT1 and MeGSTU25, that showed with high expression levels at this time point in ethylene treatment, GO annotation suggested that all the GST genes participated in the pathway of toxin catabolism (GO: 0009407); 4 genes, MeGSTZ1, MeGSTU28, MeGSTF4 and MeGSTF5, that exhibited with high expression levels at this point in drought treatment. GO annotation indicated that all the GST genes participated in the pathway of toxin catabolism (GO: 0009407). 2 GST genes were discovered with similar expression profiles in both treatments, i.e. MeGSTZ1 and MeGSTU28. 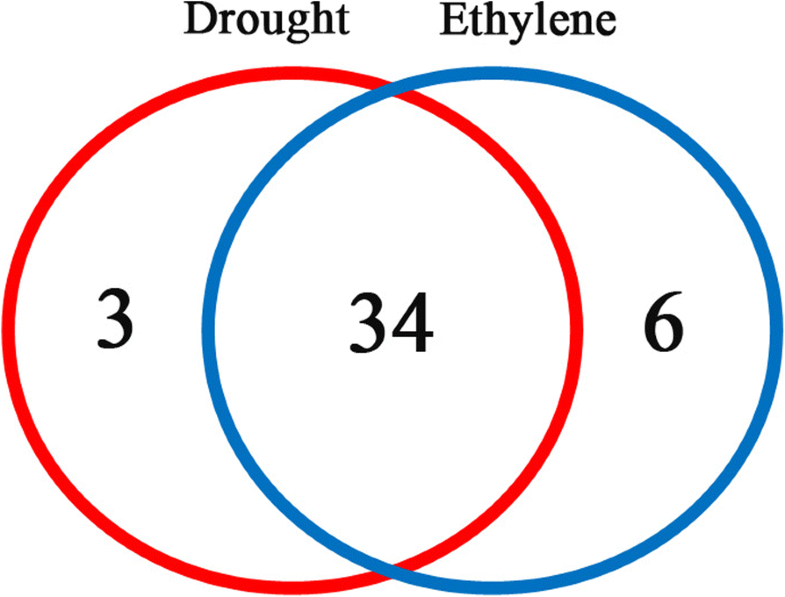 The EthS4 cluster in ethylene treatment and DrS3, DrS4 and DrS5 clusters in drought treatment indicated that the genes down-regulated throughout the experimental period. 5 genes expressed in ethylene treatment were classed into this group, i.e. MeGSTL4, MeGSTT3, MeGSTU32, MeGSTU33 and MeGSTF5, GO annotation indicated that 4 GST genes participated in the pathway of toxin catabolism (GO: 0009407); 9 genes expressed in drought treatment were grouped into this group, i.e. MeGSTU12, MeGSTT1, MeGSTL1, MeGSTT2, MeGSTT3, MeGSTL4, MeGSTU33, MeGSTU25 and MeGSTL3, GO annotation indicated that 4 GST genes participated in the pathway of toxin catabolism (GO: 0009407). 3 GST genes were discovered with similar expression profiles in both treatments, i.e. MeGSTL4, MeGSTT3, and MeGSTU33. As described above, 24 GST genes were detected with the similar expression across the time points of leaf abscission in both treatments, and 17 Tau MeGST genes have the similar expression in both treatments, i.e. MeGSTU11, MeGSTU13, MeGSTU14, MeGSTU18, MeGSTU19, MeGSTU20, MeGSTU27, MeGSTU3, MeGSTU30, MeGSTU34, MeGSTU35, MeGSTU5, MeGSTU6, MeGSTU7, MeGSTU9, MeGSTU28 and MeGSTU33, suggesting that most of the Tau GST genes played similar role in regulation leaf abscission in environment-induced leaf abscission. To further study the function of Tau GSTs in cassava leaf abscission, the expression patterns of these 17 Tau GSTs were detected in two cassava cultivars, ‘Arg7’ and ‘SC124’. The two cassava cultivars exhibit the different levels of leaf abscission under the same drought condition. Compared with cultivar SC124, cultivar Arg7 is more easily shed the leaves than SC124 cultivar when met the same drought condition . In our previous research, the middle stage at drought stress is the important stage for determining cassava leaf abscission , so we chosen T4 time point as the time point to analyze the GST genes expression in two cultivars . The expression patterns of the 17 GSTUs were analyzed in two cultivars at T4 time point with T1 as control under drought stress. The results showed that all the 17 GSTU genes were detected with expression at T4 time point in drought treatment, 15 genes detected with higher level expression in Arg7 than that in SC124 at T4 time point, while 2 genes, MeGST33 and MeGST5, showed the lower level expression in Arg7 than that in SC124 at T4 time point (Fig. 6). MeGSTU34, MeGSTU6, MeGSTU11, MeGSTU18 and MeGSTU9 detected with high expression level under drought compared with the other genes. The maximum expression ratios were approximately 3-, 4-, 3-, 2- and 4-fold up-regulated in Arg7 when compared in SC124 (Fig. 6). The GSTs family played important regulation role in enhancing tolerance to oxidative stress, osmotic dehydration, and plant hormones [1, 2]. In this study, we identified 83 GST family members from the cassava genome. 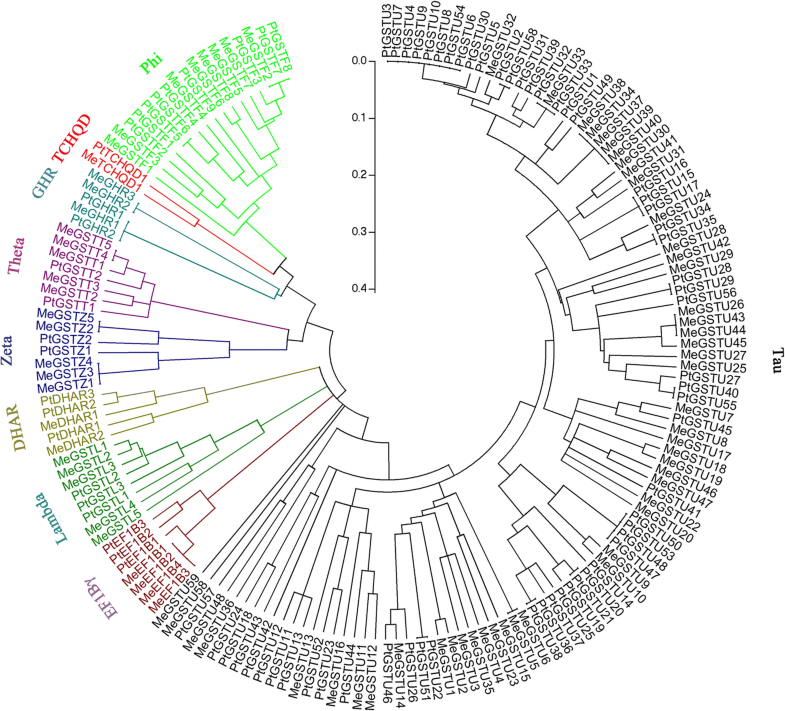 Here, 83 cassava GST genes were grouped into 9 classes (Fig. 1). Previously, Dixon et al. reported 55 AtGST genes in Arabidopsis genome. The significant expression patterns of GSTs were detected in ethylene and drought treatments induced leaf abscission in cassava abscission zones, similar genes (34 GSTs in all 83 GST genes) were induced expression in cassava abscission zones in both ethylene and drought treatments induced leaf abscission, suggesting the important function for these GST genes in cassava leaf abscission regulation, the similar expression profiles of GSTs in cassava abscission zones under various stresses induced leaf abscission, indicating that most GST genes may play important regulation roles in abscission zones development under stresses. 17 Tau MeGSTs showed the similar expression profiles in both ethylene and drought induced leaf abscission; this suggests that the 17 MeGSTU genes have the same function in regulating cassava abscission zones growth and development when suffering from ethylene and drought stresses. The primary function of GSTUs is detoxification. In our study, many MeGSTUs were detected to express in both treatments induced leaf abscission, and GO annotation suggested that most of the GSTUs participated in the pathway of toxin catabolism (GO: 0009407), suggesting that these genes may detoxify the ROS that produced during both ethylene and drought treatments induced leaf abscission in cassava. We previously demonstrated that ROS accumulated in cassava abscission zones during drought stress . In this study, we discovered that most of the MeGSTUs up-regulated in abscission zones under drought and ethylene treatments in cassava, GO annotation indicated most of the MeGSTUs up-regulated in abscission zones in both treatments can participate in the pathway of ROS, suggesting the MeGSTUs up-regulated in abscission zones may involved in regulation the adverse stresses resistance in cassava abscission zones by regulating ROS accumulation under stresses. Substantial evidence has confirmed that GSTUs play regulation roles in alleviating ROS accumulation that produced under drought stress in plants . GSTUs are proved to involve in the response to various forms of oxidative stress, such as salt, heavy metals, drought, phytohormone and others . The increase in GSTU levels can be induced by excessive ROS . In cassava, abundant ROS accumulate when the plants suffer from environmental stresses ; the ROS in the plants promote the expression of the MeGSTUs. It suggested that the high expression levels of MeGSTs in abscission zones induced by drought or ethylene treatments in cassava may confer the genes to enhance the tolerance to ROS that induced by stresses in cassava plants [29, 30]. Many GSTU were found to participate in the stress response in Arabidopsis, and the function of the GSTU that reported can regulate the level of proline and antioxidant enzymes proved by stresses in plants , additionally, the increase levels of proline and antioxidant enzyme activity in the overexpression GSTU transgenic plants that contribute the plants to promote the drought tolerance under drought. As described in our previous research, proline and antioxidant enzymes were proved to involve in the ROS accumulation and regulate leaf abscission in cassava under drought . These findings indicated that GSTU regulate the levels of proline and antioxidant can enhance resistance to stress tolerance in cassava. We also discovered high levels of proline in cassava induced by drought . Thus, MeGSTU may regulate stress response in cassava by regulating the levels of proline and antioxidant enzymes. In short, these findings suggested that MeGSTs may contribute to confer the cassava plants with robust resistance to ROS that produced by environmental stresses. In conclusion, in this study, we first identify and analyze the GST gene family in cassava abscission zone. Here, 83 cassava GST genes were grouped into 9 classes, the expression of MeGSTs was identified and characterized in different environmental stresses induced leaf abscission, and the stress-related MeGSTs were also discussed in different cultivated varieties. The hypothesis was got that Tau MeGSTs may be found to be responsible for alleviating ROS accumulation under various stresses induced leaf abscission in cassava abscission zones. We thank Dr. Wenquan Wang for providing the cassava germplasm. This work was supported by the National Natural Science Foundation of China (grant no. 31471551). The funding body had no role in the design of the study and collection, analysis, and interpretation of data and in writing the manuscript. All related data are available within the manuscript and its addititonal files. WB devised the study. WB SX and CL conducted the experiments and analyses. All authors contributed to data interpretation and writing of the manuscript. All authors read and approved the final manuscript for publishing. The cassava cultivated and wild plants used in this were collected and developed in the Institute of Tropical Biosciences & Biotechnology, Chinese Academy of Tropical Agricultural Sciences. No details, images or videos relating to any of the study participants are included in this manuscript.